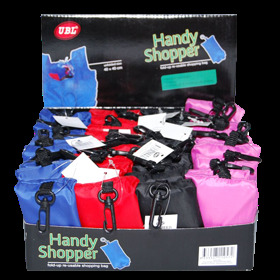 Shopping Bag Fold Up W/Pouch. Display Box 25 W x 28 D x 12 H cm. Bag In Pouch 6 x 3 x 12cm. Unfolded Size 40 x 40cm. Available in: Royal Blue l Black l Red l Pink. 190T Polyester. 0 Packaging: Bulk Pack.